We've been compiling some amazing Porsche models on the internet for over five years now, and we've seen some pretty astonishing examples pop up now and again. This week we're looking at Porsche models without any real theme or driving force, we just like them. There's a little something for everyone. Hopefully you've enjoyed our "curated" look at the Porsche market. Keep in mind, some of these Porsches could be great collection investments, while others might prove to do more financial harm than good. I have a 912E that I drive regularly, and while slow it is an absolute hoot. Mine is quite a bit more rough and tumble than this pristine beauty. It's been treated to a color change in purple, as Porsche did not offer purple in 1976, and has had a white leather interior added, as well as the fuchs refinished in chrome, and what appears to be an SC-style chin spoiler added. It's a beautiful car, but not exactly stock. This probably won't be a prime example if you're looking for something to skyrocket in value, but if you want a driver that will run for decades to come, it's hard to beat the thrum and hum drum of a Volkswagen aircooled flat four. This one is California smogged and registered, so you know it has to run pretty ship shape. Give it a go, what's the worst that could happen? You might like it. I'm not much for SUVs, but if you simply must have one, you may as well get one with three pedals and a gear stick. A Proper Porsche has a manual transmission, after all. These are quite rare, especially here in the U.S. market, but when they come up, they're usually gone pretty quickly. The idea of a truck with a stick is unique and interesting enough for many enthusiasts. This Cayenne was probably quite expensive when it was new 8 years ago, but you can have it now for just under $16,000. This seems like it would be a good daily driver to me. The second gen Cayenne is quite comfy and sportier than it has any right to be. Give it a second glance. The 997 generation Turbo has long been counted among my favorite Porsches. As a 2008 model year car, this one still has the old tried and true Mezger engine. The listing doesn't state that the coolant console has been fixed or repaired, so you may want to budget for an engine-out service, but it's a great sounding and driving engine, so it might be worth it. The fact that this one is a paint to sample rarity in the long unloved 356 Sepia Brown color, I'm even more enamored with it. It's a gorgeous color, but an acquired taste. Is it worth almost six figures for you? Speaking of paint to sample rarities, here is a brand new GT2 RS in Pastel Orange, which looks just plain spectacular. It's difficult to get a non-standard color on these special order RS models, and now that production has ended you're not about to get one to your own special tastes. If you want a PTS GT2 RS be prepared to pay through the nose for it. This example is listed for nearly half a million dollars, you see. With just 129 miles on the odometer, you're effectively buying a showroom fresh display piece. Take delivery, and then immediately go rail on it through some canyon roads or something. This car deserves better than this. If you want to find a way to go really fast for not a lot of money, the best method is to buy someone else's already-finished race car. 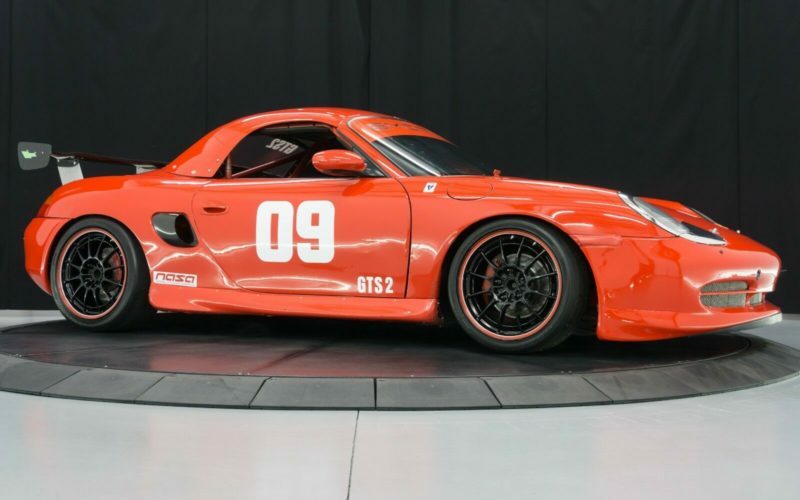 There's no better Porsche platform for on track action than the bare-bones mid-engine 986 Boxster. This one has a 3.2-liter flat six from a Boxster S, as well as a hard top, a roll cage, and all the gubbins you need for a fast lap time. This thing appears to be dialed and tuned like nobody's business, and has set multiple track records in the GTS 2 category. This is a car built for a small market, but if you're looking to get into track action, there's hardly a more forgiving chassis than this one.